Vertical Horizon is a duo exhibit by Desmond Teo and Raymond Chua, Singaporean photographers who venture into the photography pathway since the early 80’s. Desmond’s photographs represent the contemporary images of the highrise and modern architecture buildings in Singapore. Some of these structures are not often visible without raising our head to look up because it is a densely-built urban cityscape. These reflective spaces arouses the viewer to critically perceive the reflected visuality afresh. What lies beyond and inside the glasses remains a puzzle to be explored. Clutterbuck’s (1998) notion of personal reflective space refers to our capacity to take issues forward in terms of the critical analysis and understanding that underpin reflective practice. Sometimes it is hard to differentiate, whether we are living inside or outside of the structures because we are surrounded and living in such concrete jungle. Fragmentation of urban life are framed in the indefinited, mirrored and diversified composition. These high contrast architectural photographs invites the viewer to critically question their own and others’ sense of identity in the city. 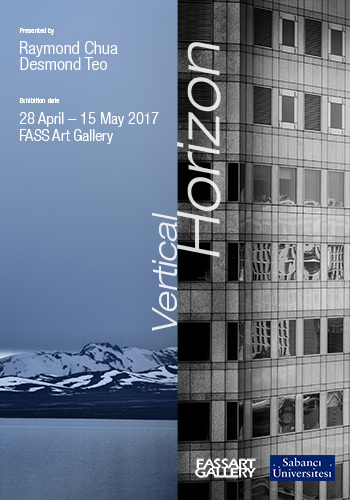 28 April (Friday Opening) – 15 May 2017, FASS Art Gallery. *Raymond Chua is the chairman of the SAFRA Photographic Society, Singapore from 1991 to 1993. Currently he is the executive committee advisor to Singapore Colour Photographic Society, SAFRA Photographic Society, Kampong Glam CC Photo Society, MacPherson CC Photographic Society and the Photographic Society of Johor, Malaysia. *Desmond Teo is the chairman of the SAFRA Photographic Society, Singapore from 2005 to 2007. He serve as the executive committee advisor in SAFRA Photographic Society and Ngee Ann Cultural Centre from 2005 till now. In 2010, He was awarded “Photographer of the Year” by Ngee Ann Cultural Centre, Singapore.